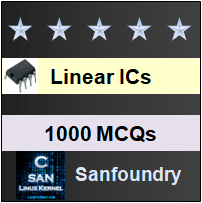 This set of Linear Integrated Circuit Multiple Choice Questions & Answers (MCQs) focuses on “Frequency Response and Compensating Networks”. Explanation: The gain of the op-amp is a function of frequency. It will have a specific magnitude as well as a phase angle. Explanation: A frequency response plot is obtained by plotting the gain of the op-amp responding to different frequencies. Explanation: To accommodate large frequency ranges the frequency is assigned to a logarithmic scale. Explanation: In frequency response plot, gain magnitude is assigned a linear scale and is expressed in decibels to accommodate very high gain ( ≅ of the order 105 or higher). 5. Which technique is used to determine the stability of op-amp? Explanation: Although frequency response and bode plots indicate the effect of frequency variation on gain, the Bode plot is generally used for stability determination and network design. 6. How many types of plots can be obtained in the AC analysis of network using Bode plot? Explanation: Two types of plots can be obtained using Bode plot. They are magnitude versus frequency and phase angle versus frequency plots. 7. What happens when the operating frequency of an op-amp increase? Explanation: When the operating frequency is increased the gain of the amplifier decrease. As it is linearly related to frequency, the phase shift is logarithmically related to frequency. 8. Which of the following causes change in gain and phase shift? Explanation: The change in function of frequency is attributed to the internally integrated capacitor as well as stray capacitor. These capacitors are due to the physical characteristic of semiconductor device. 9. Which plot is not provide by the manufactures? Explanation: Phase angle plot are not generally provided because phase shift of later generation op-amp are less than 90o even at cross over frequency. Explanation: Non-compensating op-amp has external compensating components, that is , resistors and / or capacitors, are added at designated terminals. The mentioned op-amp has three compensating components: a resistor and two capacitors.